............................ for convenience, for the odd emergency. Over the years we have found that the quality, the variety and the innovations of Victorinox have been appreciated by, and have satisfied the needs of our customers. So much so, that many have more than one "Swiss Army Knife". Following is a selection from the current range. 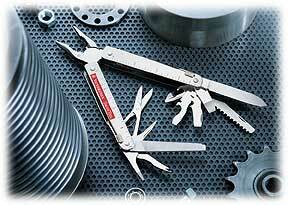 The CyberTool, like the other pocket tools developed by VICTORINOX, is elegant and compact, contains a number of tools and offers a wide variety of functions. Thanks to these features the already legendary "Swiss Army Knives" have become a daily companion, just like a wristwatch, for millions of people. They are part of the official equipment for the NASA space-shuttle crews. The CyberTool is here - especially developed for our times when computers and electronics rule the day. Thanks to 13 different screwdrivers, cleverly housed in the smallest space, the tool is in a class of its own in the fields of electronics, household, hobbies and toys. The handy bit key and bit holder can be opened speedily in the same uncomplicated way as any other tool. And another novelty: the new transparent look of the handle gives the CyberTool extra style. The marriage of pocket-knife and credit card came about after VICTORINOX decided for once not to incorporate its tools within a penknife casing but in credit card format instead. The company eagerly set about this task and packaged the individual tools in an 8.2 cm long and 5.5 cm wide plastic card. This slim little item weighs just 25.5 grams and is 0.5 cm thick. With the SwissCard, which can be easily carried in your wallet, personal organiser or purse, the most important tools are always to hand: letter opener, scissors, ball pen, nail file, screwdriver, tweezers, toothpick, needle and ruler (cm and inches), top quality tools readily accessible at all times. get two SwissCards at the same time.